Download my FREE video chart – one for a boy and a girl – to create some peace in your household when it comes to TV and computer usage. TV and YouTube video watching can become a battlefield in our household, as we struggle to help Gabriel understand that we only allow him to watch videos two times a day. The American Academy of Pediatrics recommends that children watch two hours of TV or less a day, and to not start watching TV until they’re two. Thankfully, Gabriel wasn’t even interested in TV or videos until he was about 20 months old, so holding him off closer to the age of two wasn’t hard for us. However, now as he’s approaching three years, he’d be happy sitting in front of the TV or computer for hours at a time, so we’re trying to lay some ground rules and get creative. I’ve found that clear communication and consistency with my kids makes for a much happier child and mama, and this chart also helps to help me be consistent, which is very hard for me! 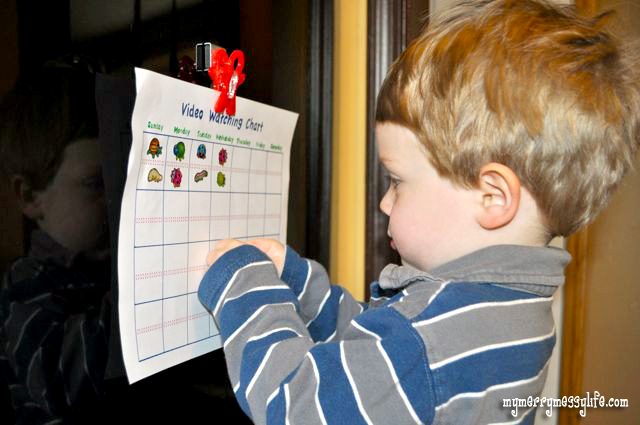 Gabe loves the shiny bug stickers I bought at the dollar store to use on his chart. So, I came up with this chart, and created one you can download for a girl and a boy. Each day of the week is divided up in two parts, symbolizing the two times a day the child can watch TV or videos on the computer. 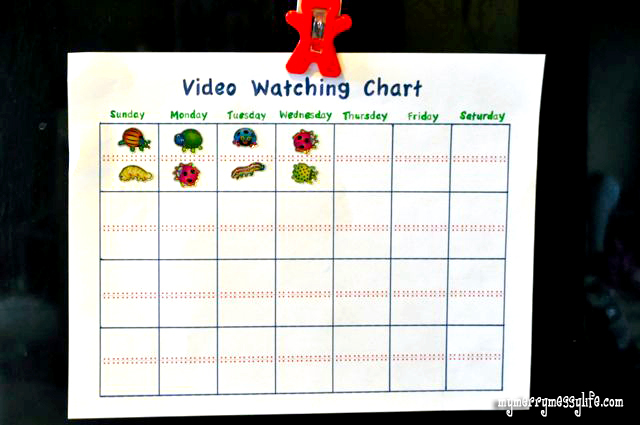 The child can color in each half after they’re done watching, or put a sticker in each space.